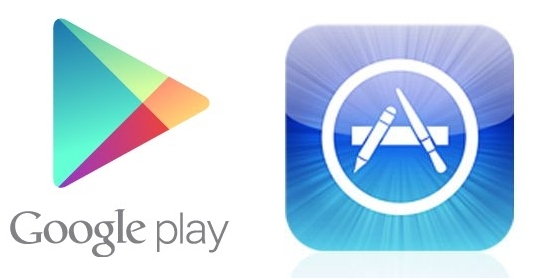 Google Play or Apple App Store? Google Play has now reached the Apple App Store in terms of revenue and Mobage data, in April 2013, confirm this trend. So the question "on which store it’s better to publish" has only one answer: develop multiplatform games and publish them on both stores. Keep in mind that users response can be very different in the two stores. Mobage with its two games "Rage of Bahamut" and "Blood Brothers" found a different trend for the revenue, according to the store in which they published. 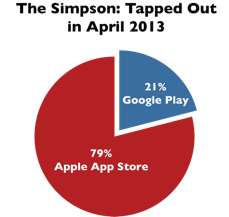 Another example of the difference that exists between the two stores is "The Simpsons: Tapped Out". This game by Electronic Arts generates more than three times the revenue on Apple App Store. Obviously if you look at the biggest picture on long term and if you are going to publish more than a game you must consider to publish them on both stores, but it is also appropriate to take notice of the differences between the two stores and the respective users. The performance in terms of revenue may differ a lot if you publish a single game. Data clearly show that the In-Game revenues are growing rapidly while we see a slow but steady contraction of one shot revenues. This trend is probably affected by the users becoming more and more used to free games. The high amount of games available on the stores may confuse the mainstream user that is not able to discern good games. A free game with in-app purchase can help lower the barrier of the common user not willing to pay for a game that he may not like. Data seem to support the argument expressed before: This is especially true (as we can see in the chart above) in the AppStore (iPhone). The high concentration of casual game users seems to lead the players to prefer the In-App purchase. The in-App purchase is also supported by the fact that it is quite easy in terms of UX to pay for in-app content with an iPhone. 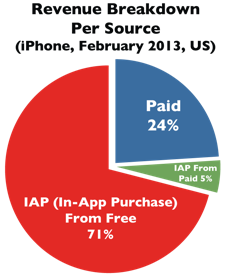 Keep also in mind that making your app free-to-play, prevents you from being targeted by piracy. If you don’t want to blow away your business you should keep an eye on these two metrics at least. CAC Cost per acquisition. People often tend to forget that publishing your game on a store is far from enough in terms of marketing, games are not stand-alone. Keeping track of the costs sustained in order to top the download/popularity ranks on the stores is vital for your startup. ARPD In order to keep your business profitable: CAC<ARPD (Average Revenue per Download) This formula applies for games that are adopting an In-Game purchase model or an Hybrid model. 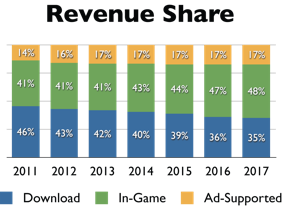 As you can see the average revenue per download can vary widely, so it is important to keep an eye on the cost per acquisition. You can be on the top downloading list without, actually, having big gains. The reason of this high variance between these two numbers can be probably found in the games themselves. Games like Clash of Clans rely on a rather small (in comparison) pool of affectionate supporters (big whales) very happy to pay even high amounts in-game. What’s the World? On the other hand, is supported by a HUGE amount of users that are making many micro-transactions. The correct strategy in order to gross huge revenues is not clear but it is definitely true that finding and keeping your ‘Big Whales in the net’ may be easier than maintaining a constantly large user base. Major publishers cyclically increase and lower the game prices. Does this technique really pay off? According to data it does. This strategy is often accomplished with the “Free for X Days” campaign. About a quarter of the games in the Top50 is adopting this strategy. This is a clever way to exploit other applications that will notify potential users of the various bargains available on the store, some of these apps have a huge user base that can be taken advantage from. Moving from Paid to Free boosts your Rank! How many downloads for Top10? We often wonder how many downloads are required to enter in one of the charts, especially the Top 10, which ensures maximum visibility in the stores. This number can actually fluctuate hugely depending on the reference day and month. We can carefully estimate that in the case of U.S. Apple App Store, 70K downloads per day (for 2 or 3 consecutive days) can be enough. The bar lowers quite a bit if we consider the Italian market, where 11K per day for 2 or 3 consecutive days can be more than enough. A good estimation of the CAC of the two different countries is 0.55€ in the U.S. and 0.3€ in Italy. Therefore it may be convenient, at least initially, to focus on a smaller but still important market. It is evident, in short, that there's a big difference between Apple App Store and Google Play. A careful marketing planning before launching our game on a store can make the difference between a failure and a success in this crowded market.